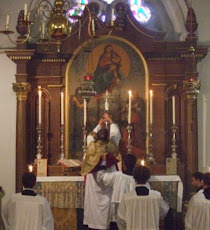 Fr Hunwicke's Mutual Enrichment: The Parish Church of the Nation, Benedictine Abbey, or the Central Ordinariate Church? I've long suspected you to have wandered out of Squire Haggard's journal, Father; a non-juring second son, perhaps. I am tempted to ask, "Where IS Westminster Abbey?" - but that would be really "dippy". I am strangely reminded of the late Bishop Wheeler (of Leeds)who on being first appointed as a bishop was to be sent to Middlesbrough. One of his friends (and I don't know if she was Anglican as he was ex C of E) asked, "But Gordon, where IS Middlesbrough?" The first Bishop of Richborough was consecrated in St Peter's Westminster. When he learned that the bishop still believed women could not be priests, the Dean became very cross and said there would be no more consecrations in 'his' church. Nor were there during his time, nor for a while after. Also in S. Paul's is Gordon of Khartoum. If memory serves, the memorial to the Iron Duke is suitably grand, but the simple sarcophagus of Gordon (plus Charlton Heston's rendition in the film) led me to more prayer and thought. So have you joined the Ordinariate yet, Father? I do apologise for my "tone", but it's all I've got left. My dear Ms Lash: I suggest that - as a literary exercise - you construct for yourself a persona, for use on my blog, of a type which I will find cosier. For a clever girl like you, that should not be too difficult. Is Ms Lash's middle name 'Whip'? BTW, if memory serves, the former Archdeacon of Leicester and now Catholic priest, David Silk, was also consecrated as Bishop of Ballarat in Westminster Abbey. The answer is obviously no. I suspect Fr Hunwicke falls in the category of "one of the more likely to do but doesn't". Let the matter rest and enjoy the blog. One wonders whether it is time that our esteemed blog host should consider approaching the previous Principal of Sommerville College to see if she still takes private cases on an Oxon. discount basis. It seems obvious enough to me that the answer will appear in its own good time. I suppose most regular readers imagine they have a sense of what's probable, and my sense would not support your speculation. At this point it remains a private decision, and can remain as such until private decisions mature to public actions.